Rehael ~ Self Respect: “Rehael is the angel of self-respect and works tirelessly to inspire respect for one’s parents. He also works hard to promote humanitarian ideals. Rehael works with both the mind and the body, and promotes health and longevity. As Rehael belongs to the order of Powers, he wears armor and holds a sword. Look at the stance of angel Rehael. Note how powerful, direct and uncompromising his gaze. He holds his sword with both hands; observe that the hilt is bright red, the colour of the base chakra signifying safety, security, trust and belonging. 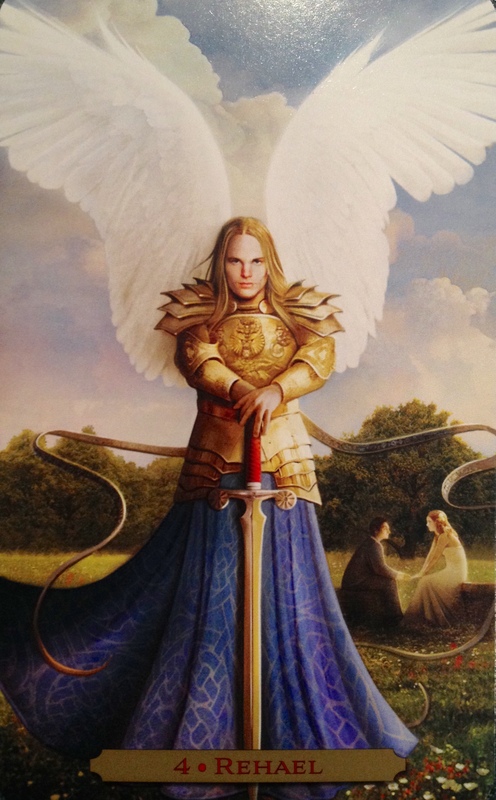 See how he is protected by his armor, reminding us to create healthy boundaries that suit our levels of sensitivity and honor them as sacred. His indigo cloak reminds us of the importance of using our third eye, fearlessly seeking the truth through our own intuition and deep inner wisdom. Rehael is encouraging us to release any shame, guilt and limitations that have previously held us back, and step boldly into our truth. He reminds us to see our own true value and connection to the Divine. He is asking us that we see our own true power, that we use it wisely and with respect. This is not about arrogance, there is no power trip; it is about confidence and strength of character. It is about seeing everyone as equal, removing the hierarchy and seeing the connection to everyone and every being in the Universe. This is true strength. When we dis-empower ourselves, we deny the light which resides within us. When we tell ourselves that we are not worthy, we are turn away from the Divine spark of our Soul. When we see ourselves as less than another, allowing them to take control of our lives or make our decisions for us, we are moving away from alignment with our higher selves. Giving away our power is not selfless, it is detrimental to our sacred journey on our Soul path. Rehael is here to guide us back into alignment with our Higher Selves, our Souls. He is asking that we trust in our intuition, and follow the guidance of our hearts. He is asking us to work with our physical bodies, moving the energy and creating a sense of balance and well being. He is reminding us to celebrate our achievements, focus on our victories and acknowledge what we are capable of. Keep our thoughts positive, and know that anything, in this mindset, is possible.